There are currently more than 122,000 people on organ transplant waiting lists in the United States. The game-changing, rapidly-evolving field of regenerative medicine promises to change the lives of many of these patients, as it enables new ways to repair body parts and tissues compromised by trauma, illnesses, and aging. Technological advancements in cell therapies, biologics, and 3D bioprinting have unlocked groundbreaking new opportunities for regenerative medicine. The present article will assess how such developments will shape the future of healthcare. It will further discuss the R&D tax credit opportunity available for companies investing in this revolutionary field of therapy. Eligible costs include employee wages, cost of supplies, cost of testing, contract research expenses, and costs associated with developing a patent. On January 2, 2013, President Obama signed the bill extending the R&D Tax Credit for 2012 and 2013 tax years. A similar extension is expected for 2014. Unlike conventional medicines, which are palliative, regenerative medicine addresses the underlying causes of disease and has the power to restore lost functionality of organs and tissues. Game-changing developments in regenerative medicine promise to resolve unmet medical needs, enabling the body to heal from within. Replacement, which is the use of cells, tissues, or organs from donors to replace damaged ones. Rejuvenation, which consists in enhancing the body’s natural healing capacity. Regeneration, which involves the delivery of cells or cell products to diseased tissues or organs. Recent research efforts have focused on boosting rejuvenation and regeneration while also developing new ways to overcome donor shortage, immunosuppression, and organ rejection challenges that are common obstacles to replacement therapies. A June 2014 report by Allied Market Research forecasts that the regenerative medicine market will grow from $16.4 billion in 2013 to $67.6 billion in 2020, registering a CAGR of 23.2% between 2014 and 2020. Central nervous systems applications are expected to be the most attractive segment, growing at a CAGR of 30.8% during the forecast period. Due to its revolutionary potential, regenerative medicine has been the subject of intensive research and development efforts. A March 2014 survey of top pharmaceutical and large-cap biotech companies carried out by the Alliance for Regenerative Medicine (ARM) concluded the majority of interviewed companies consider regenerative medicine as a potential paradigm shift in the development of breakthrough medicines. The therapeutic areas considered to have the most opportunity were cardiovascular disease, oncology, neurodegenerative disease, monogenic disorders, and ocular disease, with wound healing and burns having the greatest near-term potential. Product consistency and lack of standards were pointed out as the greatest challenges facing this emerging field. The American Society of Gene and Cell Therapy define cell therapy as the administration of live whole cells or the maturation of a specific cell population in a patient for the treatment of disease. Cell therapy technologies include stem cell-based methods for treating various disorders. The use of progenitor cells capable of developing into many different types of tissue can foster the body’s ability to heal itself and is, therefore, one of the key areas for regenerative medicine. According to Transparency Market Research, the worldwide stem cells market was valued at $26.23 billion in the year 2013 and is forecast to be worth $119.52 by 2019, growing at a CAGR of 24.2%. Regenerative medicine applications are a particularly promising segment. 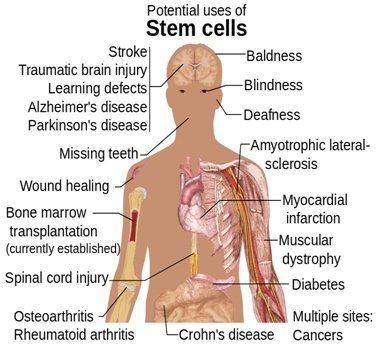 The potential role of stem cells in regenerative medicine covers a wide variety of conditions, including injuries, neurological disorders, Crohn’s disease, orthopedics, cancer, organ transplants, incontinence, infertility, diabetes, hematological disorders, liver disorders, cardiovascular and myocardial infarction, and immunodeficiency disorders. The following image illustrates diseases and conditions for which stem cell treatments are being investigated. In 2013, there were already, then there are already five or six non-pluripotent stem cells-based products in the U.S. and other countries, namely, Provenge, for prostate cancer; Appligraf, to treat diabetic foot ulcers; Carticel, to replace knee cartilage; Gintuit, to promote healing after gum surgery; and Fibrocell, for replacing fibroblasts. Since then, cell therapy has expanded significantly and current research aims to enable the use of different cells, including cardiac, muscular, bone marrow, and many others. The use of autologous stem cells proved to be a huge advancement in the cell manufacturing process. These cells are removed, stored, and later given back to the same person making cell therapy much simpler. There is particular interest in the so-called mesenchymal cells, which can develop into bone, cartilage, and fat and can be used to treat the heart, the blood vessels, and Crohn's disease. Mesenchymal cells are found in the bone marrow and various other places in the body. Their availability in the adult body is enough to treat patients with their own cells, thus avoiding the need for antirejection medication. The potential role of neural stem cells (NSC) is also extremely exciting, particularly when it comes to treating acute central nervous system (CNS) disorders and neurodegenerative diseases. Most of these diseases involve cell death, which is aggravated by the absence of regenerative abilities for cell replacement and repair in the CNS. The use of NSC could be a way to overcome this shortcoming and has been studied in the treatment of conditions such as Parkinson’s and Huntington’s Diseases as well as multiple sclerosis. In 2013, an agreement between Newark, California-based StemCells, Inc. and the California Institute for Regenerative Medicine resulted in the investment of $19.3 million to help fund preclinical development and IND-enabling activities of the company's proprietary HuCNS-SC® product candidate (purified human neural stem cells) for Alzheimer's disease. Headquartered in Hackensack, New Jersey, BrainStorm Cell Therapeutics, Inc. is also engaged in the treatment of neurodegenerative diseases, such as Amyotrophic Lateral Sclerosis. The company’s proprietary stem cell technology NurOwn™ induces differentiation of the patient’s mesenchymal stem cells into neuron-supporting cells that are transplanted into the spine or muscle tissue. They protect existing motor neurons, promote motor neuron growth, and re-establish nerve-muscle interaction. Also focusing on neural cell therapy applications, researchers from the University of Pittsburgh are studying ways to deliver stem cells to the brains of patients recovering from strokes. Their hope is to boost the brain’s own ability to reorganize and compensate for the cells destroyed. Initial results show great promise in reverting tissue damage. There is also great promise in the use of stem cell treatments to slow or revert vision deterioration. One example is the ability to grow new retinal tissue, which is then injected underneath the patient’s retina. Advancements in this area could benefit over two million Americans who suffer from age-related macular degeneration. 3D bioprinting takes the symbiotic relationship between medicine and technology to a whole new level. While following the usual additive manufacturing logic, 3D bioprinting relies on very unique materials. In other words, it consists in the ability to print with living cells. Needless to say, such ability can revolutionize medicine. For decades, tissue engineers have tried to build replacement organs. However, the traditional method of manually delivering cells has proved inadequate for the task. Not only was it arduous and time-consuming, but it also limited the complexity of tissues that were produced, making it impossible to replicate original structures. 3D bioprinters completely modify this scenario, as they allow for more efficiency and complexity. Potential applications are numerous and include the creation of cellular tissues for drug testing and medical training, and the development of transplantable and bionic organs. When it comes to regenerative medicine, 3D bioprinting is undoubtedly a game-changer that can potentially take thousands of people off of organ transplant waiting lists. In 2013, bioengineers from Cornell University have successfully built a facsimile of a human ear that looks and acts like a natural one. The process consists of printing a seven-part mold and injecting it with bovine cartilage and collagen from rat tails, which serves as scaffold. Several days in cell culture guarantee the propagation of cartilage, which eventually replaces the collagen. This achievement was considered revolutionary for children born with underdeveloped or malformed outer ears. Likewise, researchers at the Wake Forest Institute for Regenerative Medicine (WFIRM) have successfully used 3D bioprinting to build bladders, urethras, and other body parts. The Institute also works on the production of skin grafts, bioprinted with the patient’s own cells. The process consists of placing skin cells directly into a print cartridge, along with essential materials to support them, and then printing directly on the patient's wound at the site of the wound. The Institute’s innovative efforts aims to benefit thousands of soldiers with life-threatening burns. As part of a $24 million effort funded by the U.S. Space and Naval Warfare Systems Center, the WFIRM recently used human heart cells made from skin cells (previously transformed into plenipotentiary stem cells) to produce a miniature 3D printed heart. Capable of beating autonomously, the so-called “tissue organoid" has been considered a major step forward. Printing solid organs, such as the heart, liver, or kidneys, is a particularly complex task that involves more cells and requires an extensive vascular structure. Researchers from the Cardiovascular Innovation Institute at the University of Kentucky are engaged in creating a fully functioning, 3D bioprinted human heart using fat-derived cells. There have also been significant advances in the 3D printing of human cartilage, which could allow for the production of implantable replacements. On March 2015, a group Swiss researchers unveiled a process that would enable the printing of a full size nose implant in less than 20 minutes. The same technology could be used for ear and knee implants. Such implants offer significantly lower risks of rejection as they are made from the patient’s own cells. In the case of young people, they can grow together with the patient, functioning just like any other body part, which means being controlled by the internal, biologic growth engine. According to Allied Market Research, small molecules and biologics are the largest revenue-generating segment in the regenerative medicine market, estimated to have reached $9.0 billion in 2013. This particularly promising segment is anticipated to grow at a CAGR of 18.9 percent between 2014 and 2020. Also referred to as proteins, specialty drugs, or "large molecules", biological medicines are a particularly promising field for regenerative medicine innovation. They consist of medications derived from living material - human, animal, or microorganism. Different from chemically derived drugs, which constitute "small molecules" and present clear-cut chemical structures, biological medicines can be composed of up to 20,000 atoms. With 100 to 1,000 the size of traditional drugs, biologics are much more complex and harder to replicate. Such drugs also interact differently with the body than other medications and are most commonly administered by injection or infusion. When compared to traditional drugs, biologics can be significantly more effective, often resulting in abbreviated recoveries. This is possible because, unlike chemical-based medicines, biologics are more targeted to diseases. Developed through genetic modification, such drugs present high accuracy as they search for the diseased cells to be treated. Moreover, by accounting for genetic differences, biologics can provide more "personalized" treatments, specially designed for certain subgroups of patients. In 2011, the approval of the first biologic agent for maintenance immunosuppression in kidney transplantation shed light on the role these drugs can play in organ transplantations. Immunosuppressive drugs decrease the activities of the immune system so it does not attack a person's own tissues or transplanted organs or tissues. This important line of therapy faces the challenge of reducing adverse effects, which often threaten the immune system’s general ability to fight infectious diseases. Developed by Bristol-Myers-Squibb, Belatacept (trade name Nulojix), is a T-cell co-stimulation blocker, capable of selectively blocking T-cell activation. This biological drug was created to provide extended graft survival while limiting the toxicity generated by standard immune suppressing regimens, such as calcineurin inhibitors. Bristol-Myers-Squibb recently announced the results from a long-term follow-up study of Nulojix regimens, which demonstrated a statistically significant 43% relative risk reduction of death or graft loss at 7 years, with survival benefit of 52% observed as early as 5 years post-transplant. The results also demonstrated statistically significant and sustained difference in renal function of Nulojix when compared to cyclosporine-treated patients. Regenerative medicine has the potential to enhance the metabolic and biochemical function of tissues, boosting the body’s ability to heal itself. It can help retard damage to diseased tissues and repair injured ones. In other words, it can change the face of medicine. Ongoing research on cell treatments, biologics, and 3D bioprinting promise to pave the way for this unprecedented paradigm shift. R&D tax credits are available to support innovative efforts in these areas. Andressa Bonafé is a Tax Analyst with R&D Tax Savers.